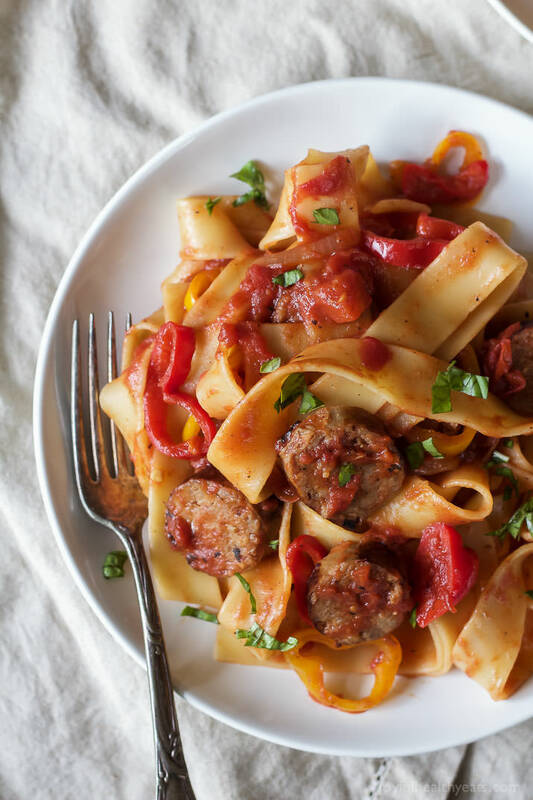 This Tomato Pappardelle Pasta with Italian Sausage and Peppers is dreamy! The pasta itself is delicious then mixed with the caramelized onions, sauteed peppers, sweet fire roasted tomatoes, and Italian sausage and you have yourself the ultimate comfort food! The pasta recipe will have you coming back for seconds or thirds its that good. Bon Appetite! Add in olive oil and italian sausage, cook for 3-4 minutes on all four sides of the italian sausage. You will want it to be browned on all sides. Remove from the pan and let cool. Into the same pan, immediately add in red onions. Stir and saute for 4-5 minutes until slightly caramelized. Add in garlic and mini bell peppers, saute for 2-3 minutes. Season with salt and pepper. Add in crushed tomatoes, stir and let simmer for 8-10 minutes. In the meantime bring a large pot of water to a boil. Add in pappardelle pasta and cook until al dente, about 11-13 minutes. Slice italian sausage and place in pepper tomato sauce, toss and then place over pappardelle pasta. Gently toss the sauce and pasta together so everything is coated. Garnish with fresh basil or shaved parmesan cheese.